Figure A. RPE conjugated mouse anti human CD19 (MCA1940PE) and Pacific Blue conjugated rat IgG2b isotype control (MCA6006PB). Figure B. RPE conjugated mouse anti human CD19 (MCA1940PE) and Pacific Blue conjugated rat anti human CD18 (MCA503PB). All experiments performed on red cell lysed human blood gated on lymphocytes in the presence of Human Seroblock (BUF070A). Data acquired on the ZE5™ cell analyzer. Figure A. RPE conjugated mouse anti human CD19 (MCA1940PE) and FITC conjugated rat IgG2b isotype control (MCA6006F). Figure B. RPE conjugated mouse anti human CD19 (MCA1940PE) and FITC conjugated rat anti human CD18 (MCA503F). All experiments performed on human peripheral blood lymphocytes in the presence of Human SeroBlock (BUF070A). From: Gonçalves R, Vieira ER, Melo MN, Gollob KJ, Mosser DM, Tafuri WL. A sensitive flow cytometric methodology for studying the binding of L. chagasi to canine peritoneal macrophages. BMC Infect Dis. 2005 May 24;5:39. A–D Confocal microscopy of IBA‐1 (green staining) immunohistochemistry of RPE flatmounts (RPE autofluorescence visible as orange due to its autofluorescence in the red and green channel) from a healthy donor (A), a geographic atrophy lesion (B), and large drusen (C and D). (A, B, D): orthogonal Z‐stack projection; (C): oblique Z‐stack projection and dissecting microscope appearance of postmortem large drusen after removal of the overlaying retina (inset). E–G Double‐labeling on the subretinal side of the retina (to avoid masking by RPE autofluorescence) of IBA‐1+ (E, green fluorescence) and CD18 (F, red fluorescence; G, merge). H. Orthogonal and lateral Z‐stack of a subretinal IBA‐1+ (green fluorescence) MPs adjacent to the RPE (orange autofluorescence) in the vicinity of a large drusen. Data information: Controls omitting the primary antibody showed no staining apart from the autofluorescence. AZ: atrophic zone; LD: large drusen. Scale bar: 50 μm (A–D); 10 μm (E–H). From: Levy O, Calippe B, Lavalette S, Hu SJ, Raoul W, Dominguez E, Housset M, Paques M, Sahel JA, Bemelmans AP, Combadiere C, Guillonneau X, Sennlaub F. Apolipoprotein E promotes subretinal mononuclear phagocyte survival and chronic inflammation in age-related macular degeneration. EMBO Mol Med. 2015 Jan 20. pii: e201404524. LFA-1 activation analyses by Flow Cytometry. (A) Profiles of CD11a, CD18 activation epitope (CD18act, representing “high affinity” conformation) and CD18 (CD18tot) expression by Teff and Treg#1 cells pre-incubated or not with indicated antibodies. 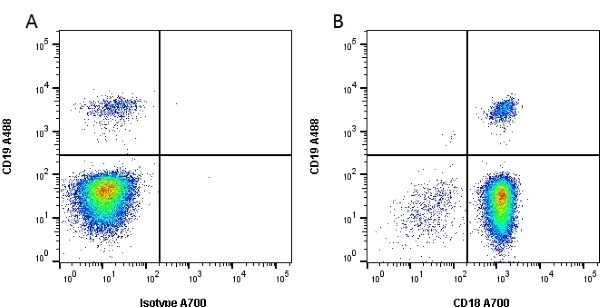 Anti-CD28 and anti-CTLA-4 were used at 10 µg/ml. (B) Histograms of Mean Fluorescent Intensity (MFI) of CD11a, CD18act and CD18tot expressed on Teff and Treg#1 cells. Ratio CD18act MFI: CD18tot was established to analyze LFA-1 high affinity conformation in indicated conditions. Data are representative of more than three different experiments. Filled gray, negative control; Red line, Teff and Treg cells alone; Green line, cells with APC; Blue line, cells with APC and anti-CD28; and Black line: cells with APC, anti-CD28 and anti-CTLA-4. Rat anti Human CD18 antibody, clone YFC118.3 was clustered at the Fourth International Workshop on Leucocyte Differentiation Antigen (code number N221) as recognizing the CD18 antigen. The CD18 antigen is an integral membrane glycoprotein of ~95 kDa, known as the beta chain, of the LFA-1 complex. The CD18 antigen is non-covalently linked to CD11a, b, c molecules. The CD18 molecule is the receptor for ICAM-1 and is thus important for cell adhesion. The main cellular reactivity of Rat anti Human CD18 antibody, clone YFC118.3 is a strong reactivity with leucocytes (platelets negative). The isolation and characterisation of this cell line was carried out with help of funds supplied by the Medical Research Council, UK. Use 10ul of the suggested working dilution to label 100ul whole blood or 106 cells in 100ul. Bindon, C.I. et al. (1988) Importance of antigen specificity for complement-mediated lysis by monoclonal antibodies. Eur J Immunol. 18 (10): 1507-14. Chabanne, L. et al. (1994) Screening of 78 monoclonal antibodies directed against human leukocyte antigens for cross-reactivity with surface markers on canine lymphocytes. Tissue Antigens. 43 (3): 202-5. Sampaio, W.M. et al. (2007) In vitro binding and survival assays of Leishmania parasites to peripherical blood monocytes and monocyte-derived macrophages isolated from dogs naturally and experimentally infected with Leishmania chagasi. Canalli, A.A. et al. (2011) Participation of Mac-1, LFA-1 and VLA-4 integrins in the in vitro adhesion of sickle cell disease neutrophils to endothelial layers, and reversal of adhesion by simvastatin. Gonçalves, R. et al. 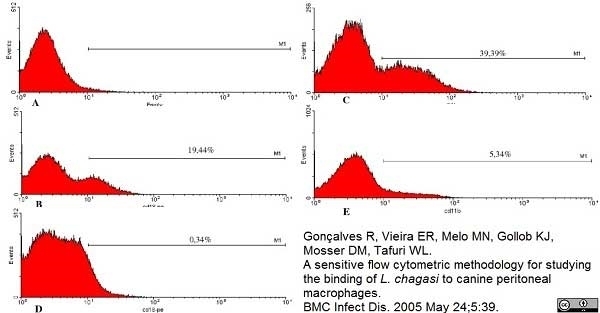 (2005) A sensitive flow cytometric methodology for studying the binding of L. chagasi to canine peritoneal macrophages. Zimmerman, K.L. et al. (2013) Leukocyte adhesion deficiency type I in a mixed-breed dog. J Vet Diagn Invest. 25: 291-6. Garland, R.J. et al. (2002) Human CD8+ CTL recognition and in vitro lysis of herpes simplex virus-infected cells by a non-MHC restricted mechanism. Scand J Immunol. 55: 61-9. Grote, K. et al. (2007) The angiogenic factor CCN1 promotes adhesion and migration of circulating CD34+ progenitor cells: potential role in angiogenesis and endothelial regeneration. Holst, B.S. et al. (2010) Expression of four canine leukocyte adhesion factors in fresh and stored whole blood samples evaluated using a no-lyse, no-wash method. Vet Immunol Immunopathol. 139: 271-6. Kupatt, C. et al. (1999) Tumor necrosis factor-alpha contributes to ischemia- and reperfusion-induced endothelial activation in isolated hearts. Marconato, L. (2013) The dog as a possible animal model for human non-Hodgkin lymphoma: a review. Spring, F.A. et al. (2001) Intercellular adhesion molecule-4 binds alpha(4)beta(1) and alpha(V)-family integrins through novel integrin-binding mechanisms. Mizuno, T. et al. (1997) cDNA cloning and chromosomal localization of the human telencephalin and its distinctive interaction with lymphocyte function-associated antigen-1. J Biol Chem. 272: 1156-63. Lana, S. et al. (2006) Diagnosis of mediastinal masses in dogs by flow cytometry. J Vet Intern Med. 20: 1161-5. Waché, Y.J. et al. (2009) The mycotoxin deoxynivalenol inhibits the cell surface expression of activation markers in human macrophages. Crosby, H.A. et al. (2009) Adhesion of human haematopoietic (CD34+) stem cells to human liver compartments is integrin and CD44 dependent and modulated by CXCR3 and CXCR4. Levy, O. et al. 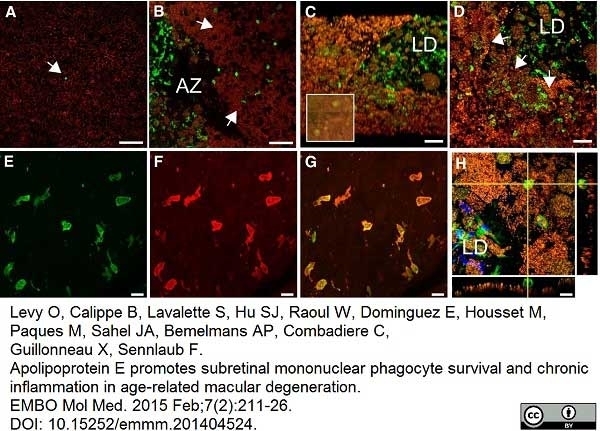 (2015) Apolipoprotein E promotes subretinal mononuclear phagocyte survival and chronic inflammation in age-related macular degeneration. EMBO Mol Med. pii: e201404524. Alex, J. et al. (2005) Pretreatment with hyperbaric oxygen and its effect on neuropsychometric dysfunction and systemic inflammatory response after cardiopulmonary bypass: a prospective randomized double-blind trial. J Thorac Cardiovasc Surg. 130: 1623-30. Sutcliffe, J.E.S. et al. (2017) Changes in the extracellular matrix surrounding human chronic wounds revealed by 2-photon imaging. Int Wound J. Jul 20 [Epub ahead of print].